Photo: Industrial League side Electric Battery Storage Company, 1916-1917. From Spalding’s Official Soccer Football Guide, 1917-18. Christmas soccer games in Philadelphia was a tradition dating back at least to 1889, the year of the founding of the city’s first league, the Pennsylvania Football Union. That year, Philadelphia Football Club and Kensington Rovers met at the Athletic Baseball grounds, which was located at 26th and Jefferson. Some 500 spectators were on hand for what the Philadelphia Times described in a report on December 26, 1889 as a “close and exciting game of foot-ball” that was “brilliantly played.” With the scoreline level at 1-1 at the end of regulation, an “additional ten minutes was played amidst the wildest excitement on the part of the spectators,” but the game ended as a 1-1 draw. The Philadelphia soccer scene had made great strides since that Christmas game in 1889, with the city boasting several senior leagues: the Cricket Club League; the Industrial League, whose teams were backed by some of the area’s leading industrial plants; the Pennsylvania Railroad Soccer League, made up of teams representing the company’s various departments; the three-division Allied American League, which included some 42 clubs; the United League; and the professional American League, home of league co-champions Bethlehem Steel in the 1915-16 season, the same season the team won the American Cup championship for the second time and became the first team to repeat as champions of the National Challenge Cup tournament, known today as the US Open Cup. Underneath these senior leagues were school-based teams that competed in the city’s Public Schools Soccer League as well as YMCA and Boys Club teams, of which several of the latter played in the Philadelphia League, a Playground League, and also youth sides under the umbrella of senior teams. With Christmas falling on a Monday in 1916, Philadelphians were treated to a rare long weekend. This should have meant a quick turnaround for Christmas Day games after league play on Saturday but, as the Philadelphia Inquirer reported on Sunday, December 24, “For the second Saturday in succession” icy conditions meant “the grounds were found unplayable in the majority of cases.” The Inquirer reported the result of only one Saturday game, a 3-0 win in Philadelphia League play for Lighthouse Boys Club over Textile at the grounds at Front Street and Erie Avenue in which both teams were unable to field a full complement of players. While perhaps the biggest game of the day involving an area team was taking place 900 miles away in St. Louis where Bethlehem Steel FC were playing the Ben Millers in a chippy affair for the bragging rights of unofficial champion of the United States, Philadelphia soccer fans had at least six local exhibition games to chose from on Christmas Day in 1916 and the city was also represented in a game in New York. In Philadelphia, an interleague exhibition doubleheader took place at Phillies Ball Park, which occupied a small city block in North Philadelphia bounded by North Broad Street, West Huntingdon Street, North 15th Street, and West Lehigh Avenue and was later better known as the Baker Bowl. 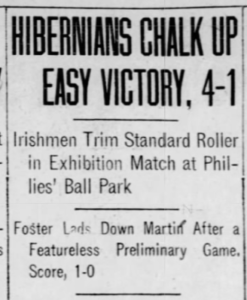 The doubleheader featured perennial local powerhouse and now American League side Hibernian, who called the stadium home for the 1916-17 season, and Industrial League leaders Standard Roller Bearing Company. Hibs had been scheduled to play Victors in a league match at the Phillies’ park on December 23 but the grounds were covered in ice. The Inquirer reported after the postponement was announced that team officials removed the goalposts so that workers could clear the field of ice before the Christmas Day exhibition game. 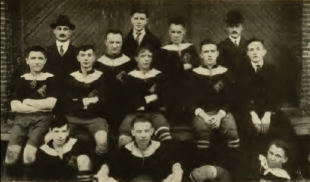 Standard Roller, “playing in their new outfits, the well-known colors of the Aston Villa soccer team,” had opportunities to get on the board, “but the front-liners, after taking the ball down the field, seemed to lack the idea to shoot.” The Inquirer‘s report continued, “In fact, the inside men seemed to be under the impression that they should run the ball into the net instead of taking a fling when well placed.” Standard would score soon after the start of the second half but Hibernian added another goal of their own shortly before the final whistle and the game concluded as a 4-1 win for the Irishmen. Another interleague game took place at Third Street and Lehigh Avenue, this game featuring Allied American League first division leaders Veterans against Industrial League contenders Hohlfeld. The Inquirer reported, “It was nip and tuck between the two teams, with the honors about fifty-fifty.” The game finished as a scoreless draw. Allied American League first division sides Falls and Wanderers also played at Third Street and Lehigh Avenue. Falls had finished the 1915-16 season second place in the division, only one point behind first place Putnam, while Wanderers had finished in third place. The Inquirer reported that, despite “the fact that they were by no means at full strength, the Wanderers were expected to put up a good game against Falls.” Instead, they were easily defeated, 4-1, center forward Smart scoring a brace. Allied American League third division side Puritan Reserves played fourth division side Peerless in a scoreless draw at Second and Clearfield Streets. A “big holiday crowd” was on hand at 63rd Street and Cedar Avenue to watch St. Carthage defeat Ascension, 5-3. A pair of league games were also played on Christmas Day. In Cardington, Wolfenden Shore defeated Electric Storage Battery Company 3-2 in Industrial League play, while Lawndale thumped Textile 6-2 in a Philadelphia League game at Second Street Pike and Howell Street. Philly tops New York on the road. Again. Christmas Day games between picked teams representing Philadelphia’s Allied American League and New York’s Metropolitan League had begun in 1913 when the Philadelphia side hosted a game at Washington Park at 26th Street and Allegheny Avenue, the home team running up a 5-0 lead in the first half before wintry conditions forced the referee to call the game 15 minutes into the second half. In 1914, the Philadelphia side traveled to a frigid Lenox Oval in Manhattan and defeated the New York side 2-1 in front of some 2,000 spectators. Back in Philadelphia at Fairhill Ball Park for the 1915 edition of the contest, the teams settled for a 1-1 draw. Incidentally, the game may have been something of a reunion for one Philadelphia player. The Philadelphia-New York contest in 1916 was the first game of a doubleheader organized by New York’s Footballer’s Protective Association, the main event being an “international” match between a team made up of native-born members of the association representing the United States against a “Continental” side made up of foreign-born players. 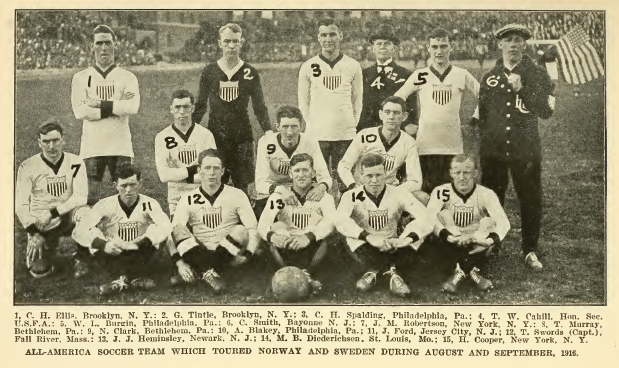 On the native-born team were four members of the side that played the first officially recognized US international games as part of the tour of Scandinavia earlier in the summer of 1916. Among the five Philadelphia-area players on the team in Scandinavia was Walter Burgin, who played for Allied American League side Philadelphia Wanderers. Unfortunately, the New York Times and Philadelphia Inquirer match reports for the Christmas game at Lenox Oval do not include a first name or initial for Burgin but it seems likely he is the same player who represented the United States in Scandinavia. Looking forward to hearing that in a contemporary context- so did these guys ride coaches, trolleys? to games? No, Josh, they ran uphill both ways in blistering snow and strong headwinds to their games…then they played full games no subs. These were men! So next time someone says Philly_tough, think of them! Merry Christmas and thank you, Ed, for sharing these stories. Great stuff, Ed. Amazing how soccer was in this country before the NFL and NBA came around. Think of fun it would be if the Union were playing tomorrow.